Creativity has been a major part of my existence... my way of (almost) maintaining my sanity, for as long as I can remember. My favorite Aunt, Aunt Peg who is a true artist, put a drawing pencil in my hand before I could write my own name. She taught me the basics of perspective, design, & how to use the color wheel before I learned to read! This is me at age 7. 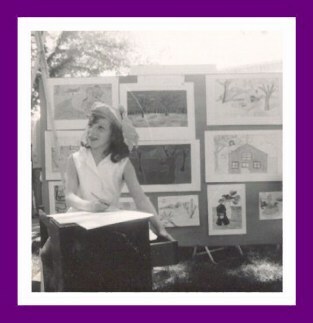 On the back of the photograph, written in my Mother's distinctive hand is, 'Karole Conaway at her 1st art fair'. My preferred mediums back then were chalk & charcoal, but I soon graduated to pastels, oil paints, watercolors & acrylics. My first experience with beads was in the '60s when a small bead store opened in my hometown of Marshalltown, Iowa. The bead store closed & I got busy with marriage, raising three children, & going to nursing school. Beads were not just put on a back burner, they were taken off of the stove until a few years ago. I was in Santa Fe, New Mexico working as a traveling nurse & my youngest daughter traveled with me. On my weekend off, we went exploring (synonymous with SHOPPING) & came across a bead store. Several hours & a lot of dollars later, we exited the shop with packages filled with hanks of brilliantly colored seed beads, fresh water pearls, gemstone beads, beading needles, & all of the other necessary equipment to turn us both into true bead addicts! Beading became my salvation when I suffered a back injury & still helps me deal with the chronic pain that resulted. Beading is an art that is truly a Magnificent Obsession!... An addiction that no one who shares it wants to be cured of... A passion that gives so many beaders who suffer from chronic illness something to take their minds off the disease & its symptoms... And, I still believe if we could get all of the virus creating hackers out there started with beading, they wouldn't want to waste time doing such things!!! guest galleries or anything else on my site, please don't hesitate to e-mail me. If you have questions about beading in general, & you e-mail me I will answer what I can & try to direct you to the right source if it is something I don't have the answer to. Thank you for your interest in my site. Please sign my Guest Book so I will know you were here. Leave a comment or e-mail if you have a question or request.